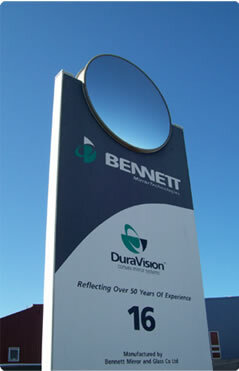 The high quality and precision engineering of Bennett Mirror Technologies has meant that we have been able to build a reputation across the world for quality and durability. One company that we work with was happy to let us tell their story. Securikey are a security products manufacturer and distributor in the UK. We have worked with them for over 20 years which has enabled us to develop and improve their convex mirrors range to match the needs of their market. Securikey use our Acrylic, Stainless Steel and Polycarbonate mirrors for a host of applications, both internal and external. The high quality of our products means that it can not only survive but can excel in tough environments. These environments including being bashed around when used for portable inspection mirrors and fork lift mirrors as well as coping in the British weather for traffic safety! However tough environments are not limited to the outdoors. Prisons, police stations, hospitals and factories also present a challenge to any equipment. The mirrors need to provide value, longevity and high performance day in and day out. Indeed, the high quality of our products has been recognised by being the only institutional convex mirror that has been awarded “Secured by Design” police accreditation. This fantastic achievement shows what strong partnerships like that between Bennett Mirror Technologies and Securikey can achieve, not only helping both companies to thrive but also makes institutions and work places safer. If you would like to know more about distribution opportunities for our product ranges in your region then please complete our contact form. As soon as we receive your enquiry, our Marketing Executive will be in contact with you directly via email to discuss your specific areas of interest and information requirements. We are always interested to hear from new people and will be pleased to help assess your marketing opportunities of convex mirrors.